*Times are approximate per Canadian Pacific Railway. Food Pantry donations accepted. Ticonderoga Community Building at 5:30 PM. LIVE HOLIDAY MUSIC by Joe McGinness will accompany the ceremony. Sound system provided by Limited Light Karaoke. Complimentary Refreshments sponsored by Silver Bay YMCA will be available inside. First 20 people will receive a candy cane and a special gift! Sponsored by the Ticonderoga Youth Commission. and decorate a snow tree with Nancy and the animals. Bring blankets and non-perishable food donations for local animal shelters. All ‘Bout Critters 4:00 - 5:00 PM Join Nancy to meet the Woodland Animals and then create your own Pine Cone Bird Feeder. Family event. $3.00 per person. Black Watch Library 6:30 – 7:30 PM Join the Black Watch Library in Ticonderoga for Family Holiday Stories. Families are welcome to attend and children are encouraged to come in their pajamas. Snacks will be provided to go following story time. All children must be accompanied by an adult. mailed out. Check out the kids section and the holiday items! Wish lists will be copied and available at the Shoppe for parents. Parents will receive a 25% Off Coupon for one item from your child’s wish list. Refreshments will be served. All children must be accompanied by an adult. holiday arrangement and centerpiece. Stop by to join them as well check out their holiday arrangements, gifts and more. Join us for a Fourth of July Chicken BBQ In December. $10.00 - Adults and $8.00 Youth 10 & Under. Shopping & Dining Night – Shop & Dine Local! Snowflake displayed. For a complete list of participating businesses contact the Chamber office. The Chamber office will be open until 9:00 PM stop in for complimentary refreshments sponsored by Stewarts Shops. FREE Raffles throughout Downtown Ticonderoga provided by the TMSP. Holiday Gift Wrapping At The Chamber Office From 5-9 PM. Provided By Silver Bay YMCA Leaders Club. Donations Accepted. Live Christmas Music Throughout Town. Provided By Ticonderoga Central School Music Departments. All ‘Bout Critters 5:00 - 9:00 PM Drop your kids off while you shop & dine. 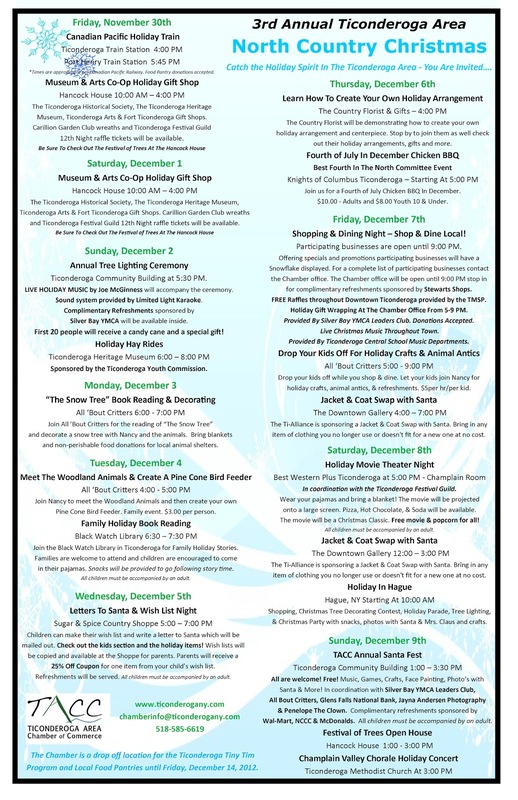 Let your kids join Nancy for holiday crafts, animal antics, & refreshments. $5per hr/per kid. The Downtown Gallery 4:00 – 7:00 PM The Ti-Alliance is sponsoring a Jacket & Coat Swap with Santa. Bring in any item of clothing you no longer use or doesn't fit for a new one at no cost. In coordination with the Ticonderoga Festival Guild. Wear your pajamas and bring a blanket! The movie will be projected onto a large screen. Pizza, Hot Chocolate, & Soda will be available. The movie will be a Christmas Classic. Free movie & popcorn for all! All children must be accompanied by an adult. 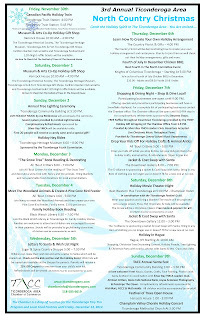 The Downtown Gallery 12:00 – 3:00 PM The Ti-Alliance is sponsoring a Jacket & Coat Swap with Santa. Bring in any item of clothing you no longer use or doesn't fit for a new one at no cost. Hague, NY Starting At 10:00 AM Shopping, Christmas Tree Decorating Contest, Holiday Parade, Tree Lighting, & Christmas Party with snacks, photos with Santa & Mrs. Claus and crafts. Santa & More! In coordination with Silver Bay YMCA Leaders Club, All Bout Critters, Glens Falls National Bank, Jayna Andersen Photography & Penelope The Clown. Complimentary refreshments sponsored by Wal-Mart, NCCC & McDonalds. All children must be accompanied by an adult.